Well placed for Edinburgh's Murrayfield Stadium and the West End. The hotel is located some 7 miles west of the city centre and sadly hasn't clinched that lucrative and probably much deserved 5 star status. The good news is that it sits just minutes from the A71 making it a doddle to access during Scotland's formidable Winter. 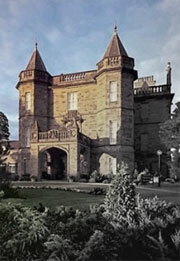 This magnificent looking mansion was at one time the home of the Earl of Morton – an astronomer and long-time patron of the Philosophical Society of Edinburgh – not that you need a degree in Philosophy to appreciate the logic of lodging here. 1000 acres of private parkland. Breathtaking scenery including views of the Pentland Hills and easy access to the stone circles of Ratho and the legendary ‘witches’ stone. PGA-approved golf academy and two 18-hole championship golf courses East Course and West Course. Designed by the legendary James Braid. Dalmahoy Lesiure Club featuring heated indoor pool, whirlpool and sauna. Spa treatments including Clarins, 'Jessica' Nails Gels, 'Fake Bake' Tanning, massage, waxing, facials. The 1000 estate provides the thinking-man and non-thinking man with the kind of serenity that even Plato would be proud of. Whilst there’s clearly a golf bias here, there’s more than enough here to entertain even if you haven’t brought your Galvin Greens. 2 PGA approved courses make this a no brainer for golfers. Kids can golf for free. Spa Restaurant is a thoroughly lavish indulgent treat.